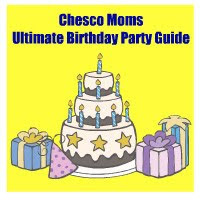 Welcome to Day 1 of Chester County Moms Holiday Giveaway Extravaganza!!! As you can see we are happy to welcome our friend Chris Byrne, AKA “The Toy Guy” from Time to Play Mag.com to our fun little online party this year. Chris has lots of fun toys to share over the next 12 days! We are kicking off the 12 days of Giveaways off with techy stuff that kids love! First up is the Tag Reading System – The new sleeker Tag reader form features an included title that lets kids sample pages and activities from across the Tag library, which is helpful to parents in finding out what kinds of themes and activities their kids are interested in so they can purchase other appropriate Tag products. The Tag reader is designed to foster children’s love of reading, making learning to read a fun, engaging adventure. 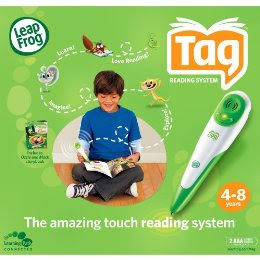 Easy to use, amazingly responsive, and small enough for a child to take anywhere, Tag reader brings books to life with just one touch. A small, sophisticated infrared camera at the tip “reads” letters, words, and symbols printed on the special dot-patterned pages of products in the Tag library. Kids can use Tag as they begin their learn-to-read journeys, then continue to enjoy it as their reading skills grow, from hearing an entire story aloud to seeking help with individual words. Parents simply download books’ audio using the PC- and Mac-compatible LeapFrog Connect Application, then sync content to the reader. It’s easy to use, highly intuitive and worry free. Parents can also see what their kids are learning while they read with Tag. The free Learning Path online resource offers personalized insights into children’s learning progress with LeapFrog products. If you are having trouble accessing the entry form please click here to enter for your chance to win.